online mode only. The online applications will be available from 22-04-2019 onwards. The official website of ITBP for applying Sports Quota Constable Posts is www.recruitment.itbpolice.nic.in. The last date to submit the application form through online is on or before 21-06-2019. The candidates will be shortlisted based on the Physical Test, Trail Test and Medical Examination. 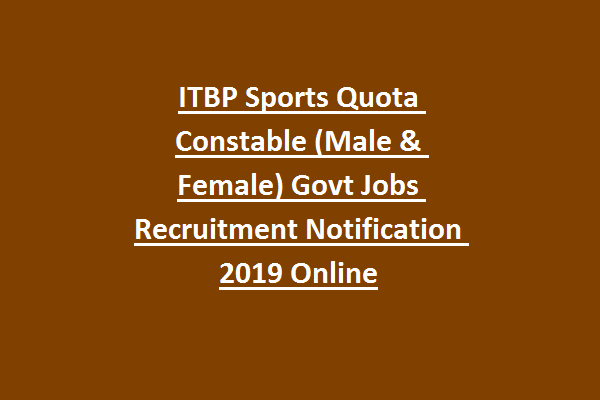 For more details of age limit, salary or pay scale, educational qualification, exam pattern and syllabus, application fee are given below for the posts of Constable (Male & Female) GD under Sports Quota Recruitment 2019. The total number of vacancies for the posts of Constable under sports quota is 121. The age limit for the Gen/OBC category candidates applying for the Sports Quota Constable Posts is in between 18 – 25 years. The upper age relaxation will be applicable as per the ITBP rules. The educational qualification for the Constable posts under sports quota is candidates should have passed 12th, any Graduate Degree from Recognized University. The application fee for the Gen/OBC/Male Candidates is Rs.100/-. There is no fee for Female/SC/ST/Ex-Ser Candidates. The candidates will be selected on the basis of Physical Tests. Garhwali, Kumaoni, Gorkha, Dogra, Maratha and candidates from Assam, Himachal Pradesh and J & K – 78-83 cms. 01 mile (1.6 kms) race within 06 minutes 30 seconds (for male) and within 8 minutes 30 seconds (for female). 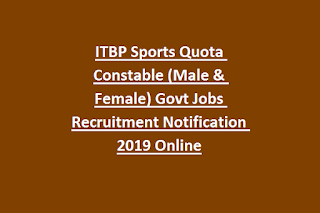 Interested candidates can apply for the Sports Quota Constable (Male & Female) on General Duty posts through online official website of ITBP is www.recruitment.itbpolice.nic.in. The online applications will start from 22-04-2019. The last date to submit the application form through online is 21-06-2019. Candidates can pay the application fee through online at the time of form submission. For more information candidates can check in the official notification of ITBP. Judo – 8 posts, Wrestling – 4 posts, Weightlifting – 4 posts, Football – 5 posts, Boxing – 8 posts, Archery – 4 posts, Gymnastics – 4 posts, Kabaddi – 3 posts, Athletics – 17 posts, Rifle Shooting – 7 posts, Aquatic – 5 posts, Karate – 8 posts, Volleyball – 6 posts, Taekwondo – 7 posts, Equestrian – 3 posts, Water Sports – 5 posts, Skiing – 3 posts.